Adelobasileus, Sinoconodon, Morganucodon and Mega-zostrodon were some of the first mammals. Another 20 or so mammalian families have been recorded in the Mesozoic (Lillegraven et al., 1979;Kemp,1982; Szalay et al., 1993; Luo et al., 2002), but many of these are based on incomplete material and their relationships are hard to assess (see Box 10.3). The main groups will be reviewed here in roughly chronological order. The kuehneotheriids, represented primarily by Kuehneotherium from the Lower Jurassic of South Wales (Kermack et al., 1968), have been difficult to interpret because its remains consist of isolated teeth and jaw fragments. The genus has gained some notoriety, however, because the three principal cusps of its teeth are arranged in a very shallow triangle and this was once said to be a forerunner of the tribosphenic molar, important in later mammalian evolution (see p. 306). The upper and lower molar teeth (Figure 10.8(a,b)) have a main central pointed cusp and smaller accessory cusps placed low on the shoulders of the main cusp. By Late Jurassic times, as many as eight mammalian clades were in existence, but their relationships are unclear (see Box 10.3). The docodonts from the Middle and Upper Jurassic of Europe, Asia and North America have been described mainly from isolated jaw bones (Figure 10.8(c)), but rare skeletal remains have also been reported from Portugal. dwelling animal that had a plantigrade posture (feet flat on the ground), with sprawling hindlimbs and fore-limbs. The scapula is surprisingly derived, looking like that of modern marsupials, but much of this may be convergent. The shoulder girdle was, nonetheless, mobile, which allowed this little triconodont to twist and turn and to lengthen its forelimb stride. Some Late Jurassic and Early Cretaceous mammals show hints of a new kind of tooth pattern in which the three main cusps on the lower and upper molars form a low triangular shape. Symmetrodonts such as Spala-cotherium (Figure 10.8(e)) have the middle cusp set nearer the tongue and well over from the other two. The most complete symmetrodont is Zhangeotherium, a partial skeleton from the Lower Cretaceous of China (Hu et al. ,1997). Four or five other families of mammals with similar molars are the peramurids and dry-olestoids from Europe and North America (Krebs, 1994). The lower jaw of the dryolestoid Crusafontia (Figure 10.8(f)) has a larger coronoid process than in Spalacotherium and there is an angular process, an insertion site for the parts of the masseter muscle block that produces sideways rotations of the jaw during chewing. The largest group of Mesozoic mammals, and one that survived into the late Eocene, were the multitubercu-lates, rodent-like omnivores that first appeared in the Late Jurassic (Kielan-Jaworowska and Hurum, 2001). Multituberculates are best known from the Upper Cretaceous and early Tertiary of North America and central Asia, but new finds have extended their range to Africa and especially to South America, where the group radiated in partial isolation in the Late Cretaceous. Kamptobaatar from the Upper Cretaceous of Mongolia has a broad flat skull (Figure 10.10(a-c)) with large eyes that appear to have faced forwards over a short snout. There are large rodent-like incisors, generally no canines and a long gap in front of the cheek teeth, as in rodents. The last lower premolar forms a large shearing blade, a feature not seen in rodents. Nemegt-baatar, a relative (Figure 10.10(d)), shows the superficially rodent-like specializations. During feeding, the lower jaw slid back and the long incisors may have been used for puncturing and snipping tough vegetation, or even for picking up and killing insects or other prey (Gambaryan and Kielan-Jaworowska, 1995). The chewing stroke was nearly horizontal and it was operated by a number of muscles, principally divisions of the masseter. The lower jaw was pulled back about one-quarter of the length of the tooth row, so that the lower incisors lay below the upper pre-molars. The effect of this chewing stroke would have been to shear vegetation, or other food material, along the blade-like lower premolar 4 and grind it between the molar teeth. head-first, and flexible elbow and knee joints (Krause and Jenkins, 1983). Two curious little bones have been found attached to the front of the pelvis (Figure 10.10(e)), and these are interpreted as epipubic bones. These appeared first in tritylodonts and they are known from several groups of Mesozoic mammals. They are retained by modern monotremes and marsupials and are known from basal placentals (Novacek et al., 1997), although they are absent in living placentals. The epipu-bic bones were once thought to support the marsupial pouch. However, studies of living opossums (Reilly and White, 2003) show that they function as small levers to stiffen the trunk during walking when one hindlimb and the diagonally opposite forelimb are forward and the others back. A great deal of debate has hinged around the tri-bosphenic molar (Figure 10.11), in which a newly evolved cusp of the upper molar, the protocone,macer-ates food in a facing basin of the lower molar, the talonid. The name tribosphenic (literally, 'rubbing-wedge') refers to the derived mortar-and-pestle type of occlusal action of these teeth. The occlusal surface is a triangle of three cusps with the point facing outwards in a lower molar, followed by the basin in which the inward-facing point of the triangle of an upper molar occludes. At one time, it was believed that mammals had two deep evolutionary lineages going back to the Late Trias-sic. One lineage consisted of marsupials and placentals, whose basal forms were characterized by the tri-bosphenic molar, plus other earlier fossil forms with triangulate cusp patterns, including Kuehneotherium.The monotremes were thought to be related to fossil forms with a linear alignment of cusps, including Morganu-codon and the multituberculates. This diphyletic theory has been discredited by cladistic analysis of early mammalian relationships (Kemp, 1983; see Box 10.3). mediate extinct relatives (Woodburne et al.,2003).This has been challenged by an alternative hypothesis (Luo et al., 2001, 2002) that the monotremes and relatives, the Australosphenida, evolved an alternative tribosphenic pattern independently in the southern continents, whereas the Boreosphenida (marsupials, placentals and extinct relatives) evolved the classic tribosphenic molar in northern continents. The tribosphenic molar (Figure 10.11(a)) has six shearing surfaces. The upper molar has a vastly expanded medial portion whose highest point, the protocone, fits into the talonid basin. The nomenclature of the cusps, ridges and facets of typical mammalian molar teeth such as these is complex (Figure 10.11(b, c)). The main terms to note are for the triangles of three cusps: the paracone (anterolateral), metacone (posterolateral) and protocone (medial) in the uppers, and the para-conid (anterointernal), metaconid (posterointernal) and protoconid (external) in the trigonids of the lowers. The talonid, occupying the posterior half of lower molars, is bounded by the entoconid (medial), hypoconid (lateral) and the hypoconulid (posterior). Modern mammals fall into three clades, the monotremes, marsupials and placentals. These three have distinctive reproductive patterns—the monotremes lay eggs, the marsupials give birth to tiny young, which in certain marsupials and in the echidna, a monotreme, finish developing in a pouch, and placen-tals retain their young in the uterus to a more advanced stage. 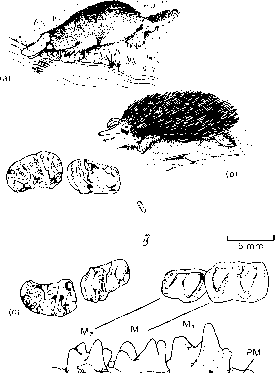 The monotremes (Manger and Pettigrew, 1998), represented today by the platypus of Australia and the echidnas of Australia and New Guinea (Figure 10.12(a, b)), share many ancestral features, such as egg-laying and an interclavicle, and two large coracoids in the shoulder girdle on each side. 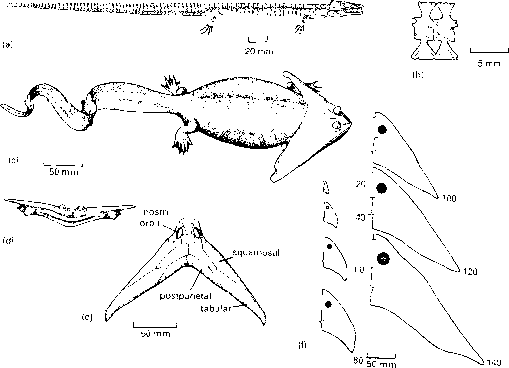 Neither monotreme has teeth in the adult, although the juvenile platypus has unerupted molars (Figure 10.12(c)) that are soon replaced by horny plates. primitive living mammals. 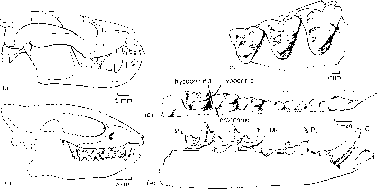 Three monotreme jaw fragments have since been reported from the Lower Cretaceous of Australia (Archer et al., 1985; Flannery et al., 1995). 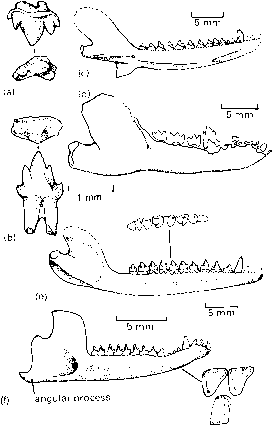 One of these, Steropodon, has lower molars (Figure 10.12(d)) that are like those of the Miocene toothed platypus in the very short V-shaped array of cusps and the height of the transverse ridges, but which also show some approaches to the tribosphenic condition. Platypus teeth have also been found in the Palaeocene of Argentina. This suggests a Gondwanan origin for the group and fits with a suggestion that monotremes arose in Australia, and that some of them migrated across Antarctica to South America, where they existed perhaps for only a short time. The monotremes have been placed in a larger clade, the Australosphenida, by Luo et al. (2001, 2002) and Rauhut et al. (2002), based on their shared tri-bosphenic-like dentition, a continuous shelf-like cin-gulid around the antero-lingual corner of the lower molar (instead of individual cingulid cuspules) and a slightly reclined hypoconulid. This view is highly controversial. Other authors, such as Rich et al. (1997) and Woodburne et al. (2003), see the Gondwanan aus-tralosphenidans, such as Ausktribosphenos and Bishops from the Lower Cretaceous of Australia, Asfaltomylos from the Middle-Upper Jurassic of Argentina and Ambondro from the Middle Jurassic of Madagascar, as true placentals, which are included among the true tribosphenids. Some Cretaceous therians cannot be classified as either marsupials or placentals. A number of intermediate forms are known from the Early Cretaceous, but most are simply teeth or very fragmentary specimens. Vince-lestes from the Lower Cretaceous of Argentina (Hopson and Rougier, 1993) appears to be a close outgroup of Theria (marsupials + placentals). Vincelestes (Figure 10.13(a)) lacks any synapomorphies of either marsupials or placentals, as well as the tribosphenic molar, but it shares with them a broad contact between the alisphe-noid and the frontal, and a cochlea that is elongated and coiled up to 360°. The cochlea is a coiled structure in the inner ear of therian mammals (see Box 10.2, illustration II(b)) that helps detect vibrations passed to it via the three auditory ossicles and pass them to the brain for interpretation. Sinoconodon, Morganucodon, eutricon-odonts and multituberculates have uncoiled cochlear canals and monotremes have half a coil. Sindelphys, a new find from the Lower Cretaceous of China (Luo et al., 2003), appears to be the oldest metatherian, sharing characters of the ankle, forelimb and dentition. It was a small, 140-mm-long tree-climber, superficially similar to an opossum. Deltatheridium from the Upper Cretaceous of Mongolia (Figure 10.13(b)), a short-snouted animal with well-developed carnivorous cheek teeth, shares some characters with both the marsupials and the placentals. Rougier et al. (1998) and Luo et al. 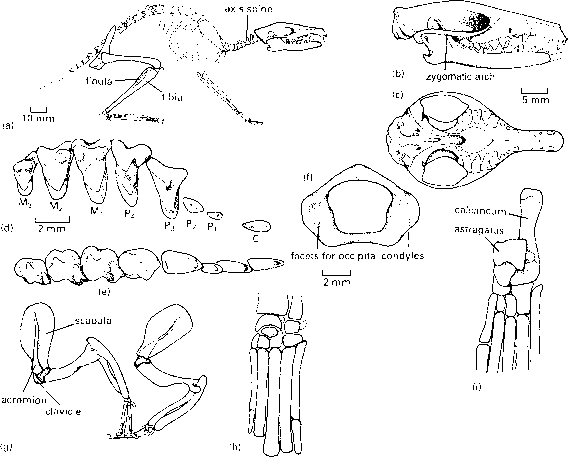 (2003) confirmed the generally-held view that the Deltatheroida is a sister group of the Marsupialia, the two forming the Metatheria, as Deltatheridium displays marsupiallike tooth replacement and cranial vascularization (see Box 10.3). The first uncontested marsupials are known from the Mid-Cretaceous of North America.An Early Cretaceous animal, Kokopellia from Utah, USA, may be the oldest marsupial, and this supports an origin of the group in North America (Cifelli, 1993a). The majority of Cretaceous marsupials are known only from jaw fragments and teeth, which have been assigned to as many as 30 species and three families, the Didelphidae, Pediomyidae and Stagodontidae (Clemens, 1979). The Late Cretaceous record of marsupial evolution is restricted almost entirely to North America, with rare forms from Mongolia and Uzbekistan in Asia and several didelphids from Peru (Marshall and Muizon, 1988). Alphadon (Figure 10.13(c-e)) from the Upper Cretaceous of North America is a typical didelphid, probably rather like the living opossum. The teeth give evidence of its marsupial nature because it has three premolars and four molars (placentals have four or five premolars and three molars). The upper molars (Figure 10.13(c)) are not as wide as typical placental molars of the same length (cf. Figure 10.14(d)) and they have several large cusps on an external shelf. In lower molars (Figure 10.13(d, e)), two of the cusps, the entoconid and hypoconulid, are very close together and more distant from the hypoconid than in placental mammals of the same time. Marsupial teeth and nursing habits are linked. Only the last premolar is replaced. The lack of replacement of the anterior dentition is related to the extended nursing of foetuses that attach in the pouch to the mother's teats. This marsupial character can be traced to the two Cretaceous forms Alphadon and Deltatheridium. Marsupials such as Alphadon form nearly half the species of many Late Cretaceous mammal faunas of North America, and it is interesting to speculate what might have happened had they not been virtually wiped out during the KT event (see p. 251). The most diverse mammals today, the placentals (Eutheria), arose around 125Myr ago in the Early Cretaceous, based on a spectacular fossil from China (see Box 10.4). Eutheria are then represented by ten or more families in the Upper Cretaceous of North America, Uzbekistan and Mongolia. Indeed, the remains from Mongolia include some very complete specimens (Kielan-Jaworowska et al., 1979; Novacek et al., 1997). Zalambdalestes (Figure 10.14(a-e)) is an agile hedge hog-sized animal with a long-snouted skull. The zygomatic arch is slender and there is no bony bar between the orbit and the temporal region. The brain-case (Figure 10.14(c)) is primitively small. There are typical numbers of teeth for a placental (Figure 10.14(d, e)), four premolars and three molars. The molars are broad and they lack the specializations of marsupial molars. All teeth appear to be replaced once, apart from the molars, whereas in marsupials there is only one set of teeth, except for the third premolar, which is replaced.